This Presidents Day Dessert is easy, healthy, and scrumptious! Celebrate Presidents day with an easy and healthy dessert! What?! Celebrate Presidents day? Who does that? Well, the government does for one. Often, government employees are off, and if you’re kids are as excited about getting the mail as mine, they’ll tell you there’s no mail that day. Technically, it is a National holiday. Many schools are closed that day. But why celebrate? Whether your kids are home with you, or in school during the day, life is filled with teachable moments. As far as schooling goes, we homeschool, AND we public school. I never thought I’d be doing both, but that’s another topic. When we wrestled with what was best for each child, my heart didn’t want to send them away all day. But, what I realized is just because they’re not with me all day doesn’t mean I’m not involved in their lives. So we make the most of each moment we have. And we love learning! So why not learn about Presidents day? 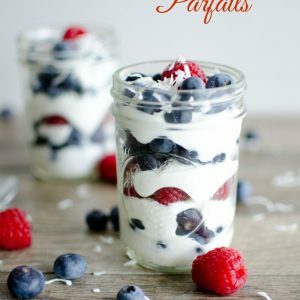 Parfaits are super easy to make! All you do is choose your ingredients and layer them in a jar or dish of your choice. In the recipe I’ve put approximate measurements to make 1 parfait. You really just want to layer the yogurt and the fruit, so when you’re making this, just do what looks best to you. It could vary depending on the size jar or dish you are using. In our family, the kids love getting their own jar to eat out of. I don’t know why, but they think that is awesome. You can make these up ahead of time and store them in the fridge. This would also make a great breakfast or snack! Happy Presidents Day! Go make today extraordinary! Start with a layer (about a tablespoon or 2) of yogurt on the bottom of a mason jar or other serving container. Place 1 Tbs blueberries on top. Finish with a dollop of yogurt, fresh berries and a sprinkle of coconut. Serve immediately, or store in the refrigerator until ready to eat. I have a thing for smoothies. Me and smoothies go together like, Laverne & Shirley. I think I’m dating myself here, anyone remember Laverne & Shirley? I love making smoothies with fresh berries in the summer, fresh apples in the fall, and this time of year? Citrus. 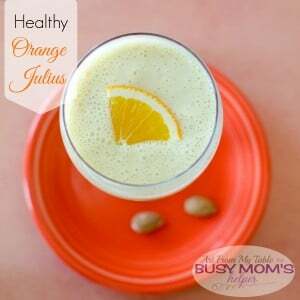 This Healthy Orange Julius will knock your socks off! Get you dancing! A long long time ago, way back before I was married or had kids, I was a hairdresser. And I had this one client that always brought me an Orange Julius. If you’ve never had one or you don’t know what I’m talking about, just make this smoothie and you’ll be caught up. I never really frequented the place where you can buy them. As a matter of fact, this client was the one that introduced me to them. And she was a faithful client. She was in every four weeks for a cut and color. So every four weeks, I got to enjoy an Orange Julius with her. She was a sweetie. One of the things that I love about Smoothies is it doesn’t take much to be fantastic. Just a few simple ingredients and Ta-da! You have scrumptiousness. So for my Healthy Orange Julius, you’ll need oranges, orange zest, a banana, vanilla greek yogurt and some almonds. You’ve got it all here folks, protein, vitamin C blah blah blah. Toss it all in the blender and you’re good to go! If you like a thinner smoothie, add some milk. I always add ice, about 5 or 6 cubes, to keep it nice and cold. The blender motor can warm it a bit. If you’re using frozen bananas (or other fruit), there’s no need for the ice. Hello, Friends! This is Steph from Steph in Thyme, and today I’m sharing a delicious – yet different – kind of breakfast recipe. This gluten-free Savory Fall Oatmeal is a bowl of cozy goodness featuring roasted butternut squash and sautéed dinosaur kale. Start your day in a new way with this deliciously healthy breakfast recipe. A bowl of oatmeal filled with fruit, cinnamon, and a touch of milk is a dreamy breakfast. But have you ever had a bowl of oatmeal with savory flavors instead? It’s certainly different, but still a treat. Cubes of butternut squash are roasted until fork tender and seasoned simply with olive oil, salt and pepper. Simple, clean, scrumptious fall flavors. While the butternut squash is roasting, minced shallot and olive oil are simmered in a skillet. Coarsely chopped Dinosaur Kale is cooked with a touch of vegetable broth until wilted. Dinosaur Kale is also known as Tuscan Kale or Lacinato Kale. I love calling it by its dinosaur name because the leaves look like the wrinkled, dimpled skin of a dinosaur. Gluten-free old fashioned rolled oats are cooked in the microwave until creamy (if you aren’t gluten-free, you can use regular oats). Divide the cooked oats, kale, and butternut squash between two bowls and enjoy immediately. This recipe serves as a delicious base for additional toppings. Poach an egg and place it on top of the veggie mound for a protein-packed breakfast. You could also add a fried egg with Parmesan cheese. Or, why not add some creamy, tangy goat cheese on top? So many ways to take up this savory oatmeal up a notch. Which will you try first? Cozy bowl of savory breakfast goodness, this oatmeal is full of fall vegetables and gluten-free. Preheat to 425 F. Place two cups of cubed raw butternut squash on a rimmed baking sheet. Drizzle olive oil over top and season generously with salt and pepper. Toss to coat and arrange squash in a single layer on the baking sheet. Roast for 20-25 minutes, flipping halfway through, until squash can be pierced with a fork. While the squash is roasting, prepare the other ingredients. Heat remaining olive oil in a medium-sized skillet over medium heat. Add the minced shallot and cook until softened, about 2-3 minutes. Add the kale and toss to coat. Season generously with salt and pepper. Add the vegetable broth and cook until wilted, about 5 minutes. When you add the kale to the skillet, place 1 cup of oats and 2 cups of water in a large microwave safe bowl. Cover and cook for 5-6 minutes until water is absorbed. Let sit covered for 1 minute. Stir oatmeal and divide between two bowls. 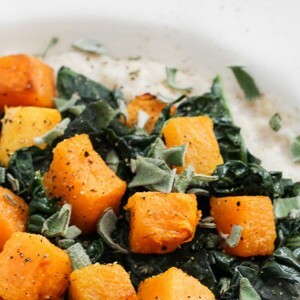 Layer sautéed kale over top, followed by roasted butternut squash. Serve immediately. This Blackberry Cream Cheese Spread is the perfect addition to breakfast or brunch. It’s also delicious on crostini or crackers with a glass of red zinfandel. I love recipes that look fancy but really are simple. This blackberry cream cheese spread is just that – quick and delicious! It makes a great hostess gift whether you’re attending a holiday brunch, or a wine soiree with a few girlfriends. With Thanksgiving and Christmas on the horizon, it’s having ideas like this that I can whip up just before I head out the door to a get together. 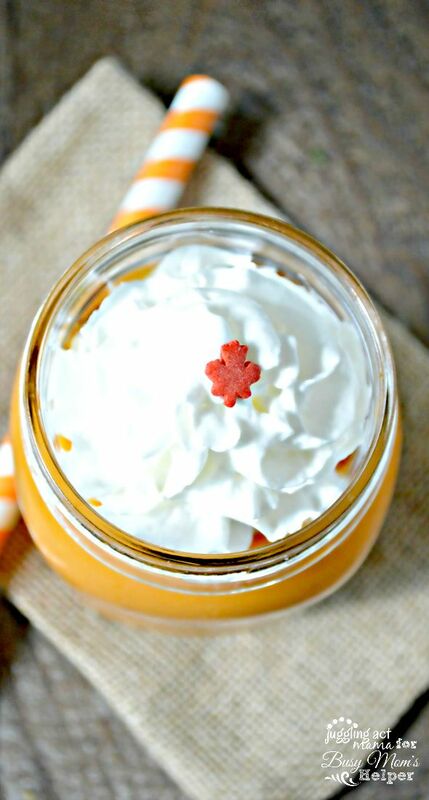 This recipe makes enough for two small mason jars, so give one away and keep one for you! For breakfast or brunch, you can serve the blackberry cream cheese spread alongside bagels. Or, if you’re feeling really inspired, use it to make stuffed french toast! 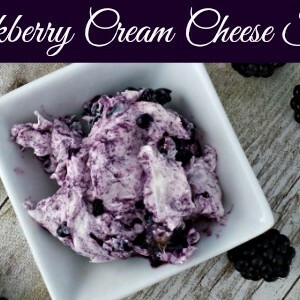 As an appetizer, this blackberry cream cheese spread equally good. Serve it on crostini or crackers with a glass of red zinfandel. It’s a super fast appetizer! Set some honey nearby and let guests drizzle a little honey on top for some extra sweetness. It looks so elegant, but takes only minutes. If blackberries aren’t your favorite, substitute raspberries instead and add an extra tablespoon of sugar to offset the tartness of the berries. In the bowl of an electric mixer, whip the cream cheese until soft and fluffy. Beat in the vanilla, sugar and lemon zest. Remove the bowl and gently fold in the blackberries gently. Store in mason jars for 1-2 weeks. I love how beautiful this looks, but it does mean you’ll have a less creamy spread. If you’d like a smoother cream cheese, add the berries to the blender and beat until well combined. The mixture will take on the purple color of the berries. Follow Juggling Act Mama – Ang Paris’s board Food Gifts on Pinterest. 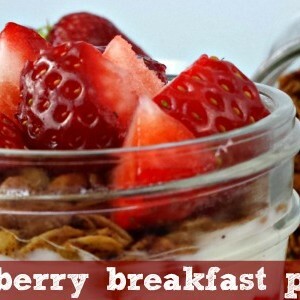 This delicious Strawberry Breakfast Parfait will get your day started off on the right foot! It’s loaded with healthy and delicious ingredients! Mornings are a blur of activity for me with getting the kids fed, dressed, combed, etc – not to mention packing lunches and making sure homework gets into the right school bag and what not. So that’s why most days I don’t actually have breakfast until the kids are off at school. With the house quiet, it’s nice to sit down after all that chaos and just enjoy my breakfast while I get ready to work. This Strawberry Breakfast Parfait tastes like dessert, but is full of healthy ingredients. I love making a big batch of homemade granola and keeping it on hand for lots of recipes, including this one. Get the recipe for my homemade granola here. Of course, if you’re not a big fan of strawberries, you could substitute any other fruit, or combination or fruits you like. In the summer, in season berries are delicious. Kiwi and banana are a great combination, too! In a pint sized mason jar, layer half of the ingredients, starting with the yogurt, followed by granola and top with strawberries. Repeat with the remaining half. If desired, sprinkle the top with wheat germ and a drizzle of honey. I just love this versatile recipe… if you can even call it that – it’s just so simple! If you’re looking to add a bit more nutrition, consider topping your parfait with a teaspoon of wheat germ, ground flax seeds, or chia seeds. A drizzle of honey is always a nice addition, too. This actually makes a great dessert for the kids, as well. Add a dollop of homemade whipped cream to the top and you’ve got a dreamy treat! 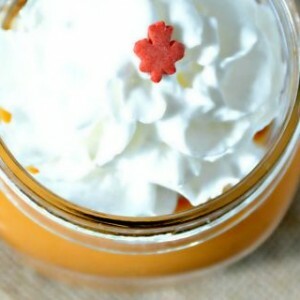 Get the recipe for homemade whipped cream here. Whether you choose to have it for breakfast or dessert, you’re going to love this simple but delicious recipe! 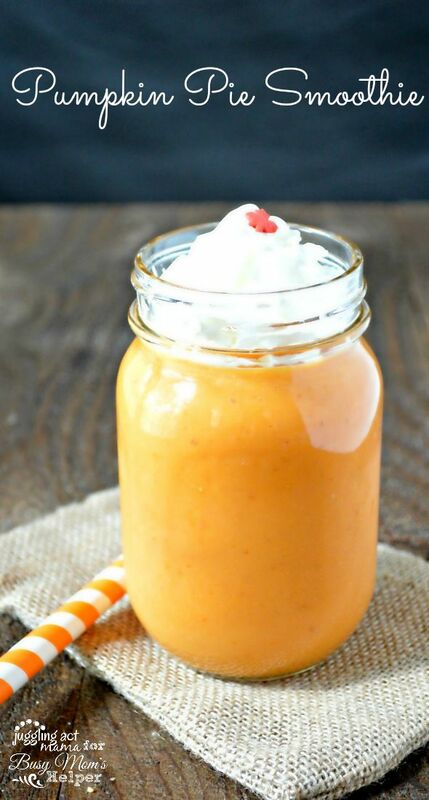 Celebrate Fall with all the pumpkin goodness the season has to offer with this homemade Pumpkin Pie Smoothie. It’s loaded with lots of healthy ingredients, but so delicious the whole family will love it! Since my birthday is in October, Fall has always been my most favorite season. I love the sunny days with the cool breezes and the beautiful colors of the trees in New England. Here in NH we’ve had unseasonably warm weather these last few weeks, and while I’m sad to see summer go, I’m sort of craving one of those crisp Fall days at the same time. Now, there’s nothing more quintessentially Fall than Pumpkin Pie, am I right? I’m so excited to share this delicious recipe with you today. This smoothie has the most amazing blend of flavors. And it’s got pumpkin puree, bananas and yogurt in it, so it is a bit healthier than the Pumpkin Spice Latte all the coffee shops are serving these days. Combine all of the ingredients in a blender. Process the mixture until smooth. For an icy smoothie, add 1 cup of ice to the blender. Top with whipped cream if desired. This is a great treat for the kiddos, too. This serving size is more appropriate for adults and teens, but I find that splitting between my two children is the perfect amount. Mine love the whipped cream topping especially! Follow Juggling Act Mama – Ang Paris’s board Smoothies on Pinterest. Looking for an easy but hearty breakfast for busy mornings? Here’s my idea of a Big Breakfast for Busy Families! We call it breakfast casserole, and everyone in my family loves it. (That’s seven people, y’all.) I’m Lynn, from Riggstown Road, here to share my go-to recipe for feeding a crowd, since it’s a good way to stretch ingredients, and it doesn’t require me to stand in the kitchen all morning! That makes it the perfect big breakfast for busy families. And did I mention everybody loves it? This meal is done in about 20 minutes, start to finish (most of that is oven time,) but if you want to speed it up for school mornings, brown the sausage the night before OR make the whole thing a day ahead and refrigerate. Individual slices heat up nicely in a few seconds in the microwave. That leaves more time for the important things busy families have to do, like…looking for missing shoes! 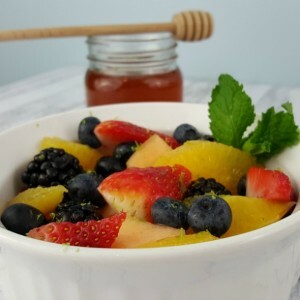 This recipe is the best way I know for a family to feel they’ve had a nice, big breakfast, with a minimal amount of time or work for the cook. And it’s a little more special than a plate of scrambled eggs. 😉 I love being about to make something special with things I already have on hand, and these simple ingredients are things I usually have. Grease a 9 x 13 glass baking dish with butter. Set aside. Brown sausage in a skillet. Pour sausage into baking dish, including any drippings. Pour egg mixture over sausage. Sprinkle cheese over egg mixture. 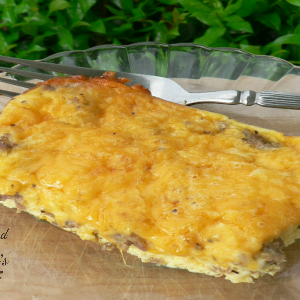 This breakfast casserole is yummy and filling just the way it is, but you can fancy it up a little by adding a layer of sautéed onions, peppers, mushrooms, and spinach over the sausage. For a meatier version, double the amount of sausage. It works just fine. For a vegetarian option, just leave out the sausage and use those veggies as the base. Either way, it’s delicious. And as an added bonus…it’s gluten free! Let me know when you try it! These Blueberry Oat Muffins by Juggling Act Mama for Busy Mom’s Helper are loaded with fresh sweet blueberries, hearty oats and a few chopped walnuts. I don’t know about your house, but at mine mornings are a whir of activity. The kids seem to have turned into turtles overnight, moving as slowly as possible. Despite my constant coaxing, we’re nearly always running out the door with me saying ‘ComeOnWeAreGoingToBeLate’ with a muffin or granola bar half in my mouth! Having something quick and easy, but healthy and filling that we can grab as we hustle around in the morning is our saving grace sometimes. 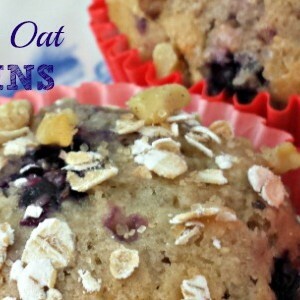 These blueberry oat muffins fit the bill perfectly. Last summer, we picked so many blueberries, that I froze them in gallon-size bags. Now I just thaw the berries and in no time I can whip up a batch of these on the weekend. They make great in-between meal snacks, too. These will keep in the fridge for about a week, if they last that long! These Blueberry Oat Muffins are loaded with fresh sweet blueberries, hearty oats and sprinkled with toasted chopped walnuts for a delicious healthy breakfast on-the-go! Preheat the oven to 350-degrees. Spread the oats and nuts on a baking sheets and toast in the oven for 10-15 minutes to bring out the flavors. Meanwhile, in a large mixing bowl, whisk the egg whites. Add the applesauce, canola oil, lemon zest, and vanilla. Stir to combine. Once you are done toasting the oats and nuts, set the walnuts and 1/4 cup of the oats aside for the topping. Preheat the oven to 400-degrees and prepare a muffin pan with paper liners or coat with cooking spray. To the mixing bowl, add the flour, sugar, baking powder, milled flax seed, wheat germ, salt and the rest of the oats. Stir to combine. Spoon the batter evenly into the muffin cups, taking care not to fill more than 3/4 of the cup. Top with the remaining oat and walnut mixed. Bake 18 to 22 minutes or until a light golden brown. Remove the muffins from the oven and allow to cool in the pan on wire rack 5 minutes. Turn the muffins out onto the rack and serve warm. You can also double the recipe and make a big batch to freeze. After they cool completely, wrap them individually in plastic wrap, then slide them into a gallon-size freezer bag. They’ll keep for a couple weeks in there and are great to have on hand. To thaw, just remove them from the freezer bag and set the individual muffins in the refrigerator overnight. Hello, everyone! This is Stephanie from Steph in Thyme, and today I’m sharing my favorite breakfast toast recipe with you. For mornings when you want a satisfying breakfast without the fuss, this healthy Smashed Chickpea & Avocado Toast will fill you up and fuel you for the day ahead. A slice of (gluten-free) toast with healthy fixings is my favorite way to start the day. It’s filling without feeling heavy, pairs well with that first glorious cup of coffee, and has plenty of texture and even a bit of crunch. Typically, I’ll slather almond butter over top the slice as soon as it comes out of the toaster then finish it off with a sprinkle of hemp or chia seeds. After a long, Boston winter and many many slices of this breakfast toast variation, it’s time to mix things up with fresh, lighter ingredients. Chickpeas, also known as garbanzo beans, are an excellent source of soluble fiber and protein. Avocados contain more potassium than a banana and are rich in heart healthy monounsaturated fatty acids. Combining the two together really packs a nutritious punch! Both have a creamy, buttery flavor that’s heightened when combined together. Diced red bell pepper and thinly sliced scallions bring a burst of color and texture to the creamy mixture. A touch of lime juice just before serving adds a lovely citrus brightness. This toast isn’t just for breakfast, but also makes for a quick, healthy lunch or snack as well. I would love to hear from you. What is your favorite quick, healthy breakfast? Please share in the comments! A quick and healthy breakfast toast filled with protein and fiber to fill you up and fuel you for the day ahead. With a fork, mash the avocado until creamy, then add to a small bowl. With a fork or your fingers, mash the chickpeas until a dry paste forms. Add to the same bowl as the mashed avocado. Combine the avocado and chickpea mash together, stirring in the diced bell peppers, thinly sliced scallions, and lime juice. Season to taste with salt and pepper. 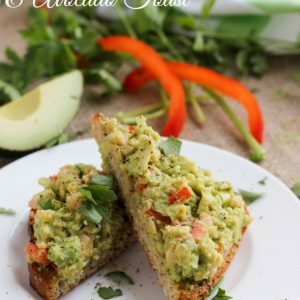 Toast two slices of bread, then generously spoon the chickpea and avocado mixture on top. Season with additional salt and pepper and lime juice, if desired. Slice in half and garnish with chopped fresh parsley. To me, nothing says ‘summer’ quite like a good ol’ S’more. With all the cold we’re having (it’s Texas, for crying out loud! ), I really needed to at least FEEL like winter was about over. Back to my muffin addiction, and Viola! 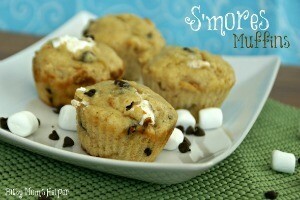 You’ve got delicious (and fast because, hey, mornings are rushed enough) S’mores Muffins! Okay, so chocolate and marshmallow MAY not be the healthiest breakfast, but they can’t be too far from the sugary cereal or poptarts I could do, right? They sure taste better, though! I also use them for a great snack; they get their ‘sweet’ fix, but it’s healthier than many of the other options. Preheat oven to 400 Degrees F. Spray or line a 12-cup muffin tin. Use the fork to ‘smoosh’ the Butter and Sugars together. Stir in the Egg, Milk and Sour Cream. In a separate bowl, mix the Flour, Graham Crumbs, Salt, Baking Powder, Baking Soda and Cinnamon. Add to the Butter mixture until well-mixed. Carefully stir in the chocolate chips. Fill the muffin cups 1/4 of the way full of batter (just barely covering the bottom). Add some marshmallows, about 3-5. Top with more batter until 3/4 of the way full. Bake for 14-16 minutes, or until cooked through. If you use the toothpick trick, remember that it may be done but still come out with melted chocolate chips or marshmallows. Don’t overcook! What are YOUR favorite type of muffins?